This month is a very busy month for us as we are preparing for our forth release in November. This will be our biggest release yet with 16 orangutans being released and of those 16 orangutans 5 of them have infants; so a total of 21. This includes both semi-wild orangutans and our first rehabilitated orangutans, which is very exciting for us all! We will shortly be putting their profiles on the blog so you can follow them through their journey. The camp at the moment is being prepared to accommodate the teams necessary for the release and monitoring. All the necessary logistics for the release are being put into place such as new standalone sheds to better conceal the food stored at camp, waste and kitchen. 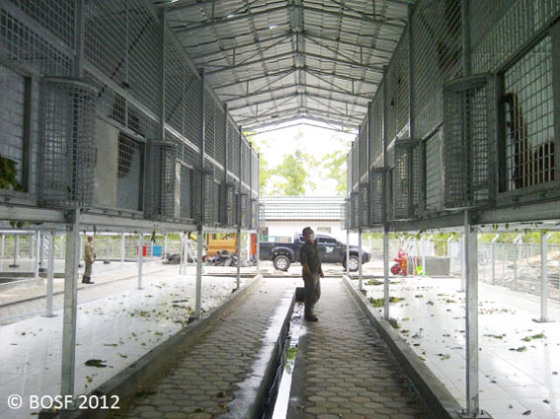 We aim to orangutan-proof our camp as much as possible! We are also preparing for the film crews who will join us to document this momentous occasion. The team have also already started to install solar panels for charging computers and batteries, walkie talkies, etc. While the necessary actions are taking place in Batikap, back in Nyaru Menteng we are preparing the candidates (their profiles will be released soon) for their release. As well as the different release points for the orangutans, transport schedules for the release candidates, and schedules for the teams. There is a lot of preparation and organizing that comes from a collaborative team here in Nyaru Menteng, Bogor and Batikap. We are all very excited about this release and cannot wait to begin the monitoring. There will be more orangutans to follow after this next release and intense monitoring of the rehabilitated orangutans will take place as well. On top of that we are very happy with the progress of the already released orangutans in Batikap as they are adapting very well to their new home.